With bunk beds for the kids all the comforts of home and an ideal location the non-smoking Wyndham Garden San Diego gets a thumbs-up from our guests headed to the area. This three-story property has 316 non-smoking rooms with flat-panel TVs work desks and coffeemakers. Beds have pillowtop mattresses and cotton linens plus lots of fluffy pillows. Most accommodations have microwaves and mini-fridges. Family suites have a double bed for parents and bunk beds for the kids separated by a half-wall for privacy. The lobby is contemporary with blue and sand decor and floor-to-ceiling windows. The hotel also has a restaurant bakery and 24-hour business center with fax and copy facilities. After a day at SeaWorld or Balboa Park the hot tub and game room beckon. There's even an on-site laundry. 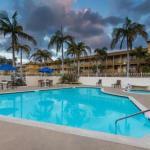 Located off I-8 Wyndham Garden San Diego is less than two miles from SeaWorld. Legoland is 40 minutes from the property and the world-famous San Diego Zoo in Balboa Park is 10 minutes away. Downtown San Diego is seven miles from the hotel and San Diego International Airport is five miles away.